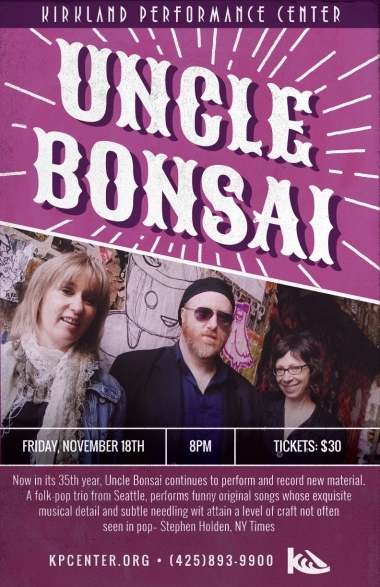 Now in its 35th year, Uncle Bonsai continues to perform and record new material. The group has eight recordings and, in mid-2013, released its first ever “bedtime book for grownups,” The Monster in the Closet/Go To Sleep. This fully illustrated, reversible, hard cover book for parents, features two popular Uncle Bonsai songs, with artwork by members Arni Adler and Patrice O’Neill, and includes a recording of the songs. The group is currently recording a new cd, tentatively titled: “The Family Feast: The Study of the Human Condition, First World Problems, and the Lasting Physiological and Psychological Effects of Eating Our Young,” due for release in November, 2016.